Sharks form strong social networks that are relatively unaffected when several members leave the group, and members also learn how to avoid capture, new research released today has found. Researchers investigated the blacktip reef shark's (Carcharhinus melanopterus) social network, and revealed that not all sharks are equal in terms of maintaining the connectivity within their social network, in a study published in Biology Letters. Where individual sharks were removed from the network, and they found that up to 50 per cent of the population could be removed before the entire network collapsed. 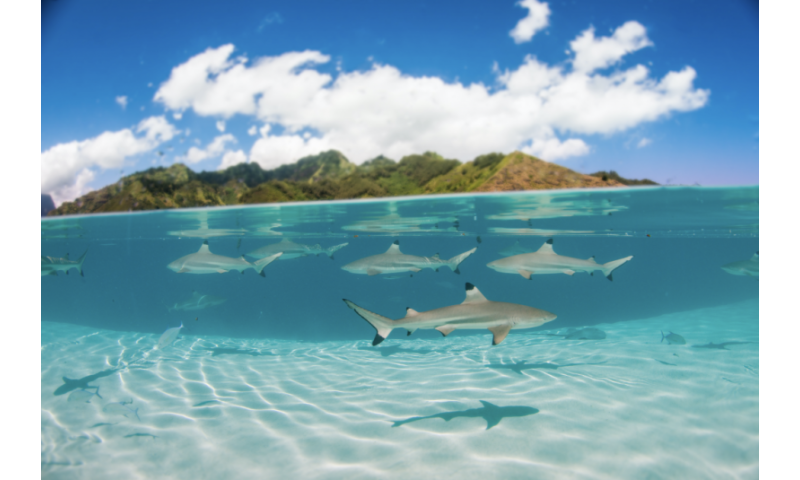 The researchers, from Macquarie University and the Centre de Recherche Insulaire et Observatoire de l'Environnement, examined a population of the sharks in French Polynesia. "The sharks have many relationships with other sharks in their network, so a large number of sharks can be removed from the network before the network breaks down," said study author Dr Johann Mourier from the Centre de Recherche Insulaire et Observatoire de l'Environnement. "This is a sign of a resilient society." The role that an individual shark plays in its social network helps maintain social cohesion and can enhance the shark network's resilience to environmental and human-influenced disturbances. "It may surprise people that sharks have social networks too. Sharks have traditionally been assumed to show some form of social structure only in particular situations like mating, feeding or migrations. Even though their social structure is not as complex as that of some mammals, sharks can display an affinity for one another," said study co-author Associate Professor Culum Brown from the Department of Biological Sciences. In addition to this surprising result, the researchers also noticed that the sharks already caught were increasingly difficult to catch again as they avoided the fishing gear. This has implications for population size estimates based on mark-recapture methodologies. "The shark's ability to learn from previous negative experiences resulted in a network that is more resilient to removal from fishing" said Dr Mourier. To study the social network of sharks, the researchers used the patterns found on the dorsal fins – which are like fingerprints in humans – to identify each individual shark. "By observing which sharks hang out together at given time points, we can build a social network," said Associate Professor Brown. "This study highlights the complexity of relationships between individuals in the wild and suggest managers need to rethink their approach to conservation questions by keeping in mind that each individual plays a different role in social relationships and thereby influences population resilience," concluded Associate Professor Brown.